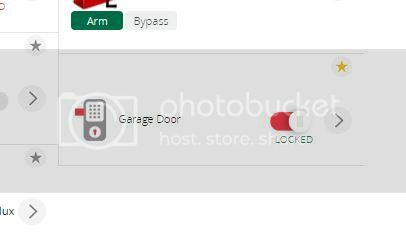 I use the Garage Door plugin which RichardTS has taken over from. My garage is marked in Vera as locked. But ImperiHome is now using open images to label it on a dashboard. Walk into your garage ... which one is right ? Sometimes, not very often, Vera reports the door is open (or it did not close). Usually it is a notification the door is still open after 10 minutes. My camera helps me confirm it is really closed. So either I put up with 1 reminder alert it is still open every 10 minutes, or, I use VeraMate to "Close' the door, which it opens, and then I tell it to Close it again, and Vera correctly reports it is closed. Happened Saturday morning as I was going out of town and Sunday afternoon on my way to soccer. It has been weeks since it acted up. The door sensor is hardwired into the Insteon relay using a PLM plugged into the USB of Vera so it should not be a communication issue. I do not think it was a LUUP restart issue either. Just something I put up with from time to time. The second one should get it in case the first did not. That is what I did manually Saturday and Sunday. It was strange it happened 2 days in a row. Did not do it Sunday evening when we went to dinner, or today when my wife went to work, I went to work, came home for lunch, when the wife came home and left a couple of times, and I came home tonight. It happens maybe once or twice a month, not enough to bother me. Starting about a week ago after an imperihome update mine also switched. All it was was a reversed icon in the imperihome icon settings. I just push and held the icon in the imperihome app and check box or unchecked the box that says reverse or inverse icon. And all is well now. I have a tilt sensor on my garage. Sometimes...not often, it gets stuck with change of temperature. Very annoying. It seems to be temperature independent - happens all year long.